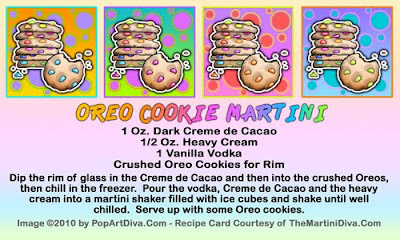 OREO COOKIE MARTINI - No Need to Dunk! Here's an Oreo that's already dunked for you - and it's dunked in booze! The crunch comes from using real crushed Oreos on the rim. And those new Oreo Fun Stix are the cutest garnish on this martini - I slid one into the Oreo Cookie Martini - talk about an Oreo Rush! Next time you decide you need some cookies and milk before bed try this martini instead. 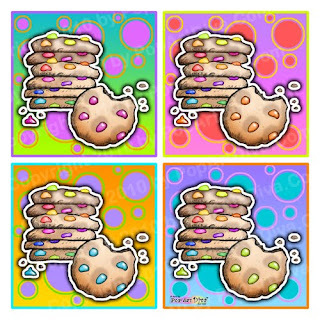 The pop art cookie design from the recipe card is available for licensing and on Posters, Tees, Business Cards, Shoes, Aprons and other fun gifts from The PopArtDiva Gift Gallery.